Hampden Park is to have a new pitch laid on Monday free of charge in time for next weekend's Scottish Cup semi-finals. A new surface was installed last month ahead of Ross County's League Cup final win over Hibernian. 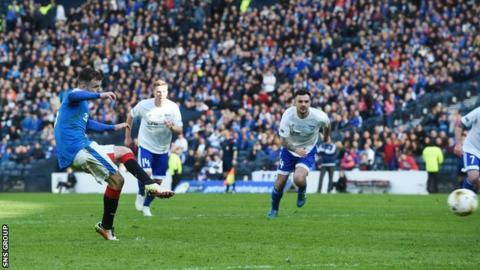 But the grass was in poor condition for Rangers' Challenge Cup final victory against Peterhead on Sunday. Rangers return to meet Celtic at the national stadium next Sunday, the day after Hibernian take on Dundee United. The replacement pitch process begins on Monday and will be completed by Tuesday. Peterhead boss Jim McInally described the pitch as "dangerous" after four of his men were injured in the loss to Rangers. "It's better for it to be relaid than to try and play on that if you are trying to play two semi-finals next week," he said. "It is in really, really poor condition. It is solid." Peter Dallas, managing director of Hampden Park Ltd (HPL), said: "This latest action is deemed necessary after discussions with our pitch supply chain and representatives from the independent Sports Turf Research Institute following the installation of a new surface only five weeks ago. "While the pitch is in an adequate playing condition, and has been professionally managed with an extensive maintenance and nutrition programme, regrettably it became evident that the rye grass in certain strips had not grown as expected. "Given the recent six-figure investment, we expressed our concerns through the established supply chain and reached agreement that a new surface would be relaid at no cost to HPL. We spoke to our colleagues at the SPFL to assure them the decision would have no impact on today's Petrofac Training Cup final. "We are confident that this action will provide the best possible playing surface for the Scottish Cup semi-finals and, indeed, the climax to the Scottish football season."